The way life is supposed to be, is the way it is. The days are unhurried. The attitude easy-going. Kick off your shoes and stroll beaches hunting Petoskey stones. Leisurely browse unique shops. Take in the natural beauty and endless recreation that make this a Michigan treasure. May in northern Michigan is such a beautiful time of year with buds popping out and the grass greening in. Our hiking and biking trails are nearly clear of snow and soon we’ll have mushrooms and trillium coming up. Along with all that, May is also Wine Month in Michigan and we are making the most of this in the Petoskey Area! What’s up with the wineries? Twelve wineries make up what was formerly known as the Bay View Wine Trail. The group is part of the newest AVA (American Viticultural Area) known as the Tip of the Mitt AVA and includes wineries in Petoskey, Harbor Springs, Charlevoix and Alanson. The collective recently changed their name to be more reflective of who they are – the Petoskey Wine Region. Each of the wineries of the Petoskey Wine Region is new in about the last seven years. You’ll find that wine made from hybrid, cold hardy grapes is definitely worth a visit to northern Michigan! 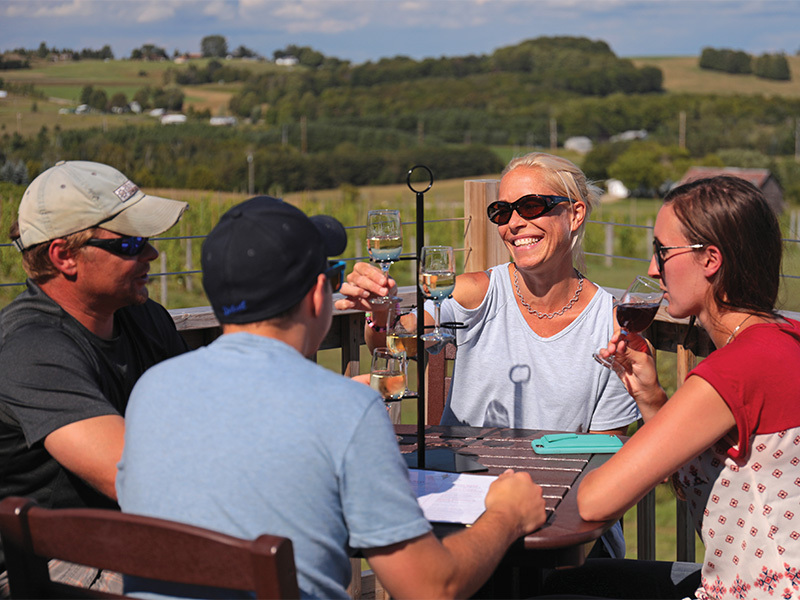 The wine selections here don’t stop at those made from grapes – a variety of other fruits work well at pleasing palettes and even maple is used at Maple Moon Sugarbush & Winery to create one-of-a-kind flavor sensations. May 9 – Petoskey Uncorked – Wine lovers will want to come visit as the wineries present Petoskey Uncorked from 5 – 8pm at the new Great Lakes Center for the Arts. $15 allows guests to taste wines from all 12 wineries, and find out about the region’s new mobile app. May 10 – 12 – Wine on the Bay at the Inn at Bay Harbor celebrates wine with a fantastic weekend lineup. Enjoy a wine tour to three of the local wineries, sip a mimosa and relax at Sparkle at the Spa. Special dining menus and tasting events throughout the weekend are topped off with a delightful Mother’s Day Brunch and unbeatable views. This is truly a special wine weekend! May 11 & 12 – Rose´ and Roses Festival – Visit the intimate wineries of the Petoskey Wine Region, purchase a tasting and receive a lovely rose – you could get a whole dozen! Celebrate mom and share the delicious wines and the beautiful flowers with her or someone else you care about. Various dates in May – Sip & Paint – These events are so popular at Walloon Lake Winery that there are nine separate dates in May to choose from! Take a midweek getaway with your bestie and sip a glass or two while creating a work of art with the help of Martina Hahn. May 17 – Morel Fest Wine & Dine – Deer Lake in Boyne City is the backdrop for this annual event that always sells out. Two seatings – one at 5:30pm and one at 8pm – give more guests the chance to taste some fantastic wines while noshing on a seasonal favorite – morels! Either / or are wonderful, but pair the two and you’re really in for a culinary pleasure. Why not come and celebrate Michigan Wine Month in the Petoskey Area? There’s a lot going at our wineries and throughout our communities as spring comes forth in all its glory. Find out more about lodging and events by visiting PetoskeyArea.com.